The activities of the Department of Soil and Water Sciences/Seagram Center in applied research focus on problems such as irrigation, soil fertility, development of novel application methods for both water and agrochemicals, soil, water and air contamination, and meteorological studies on the microenvironment of agricultural plants. Basic research encompasses soil chemistry and mineralogy, irrigation, hydrology, soil physics and agrometeorology, as well as some of the more fundamental aspects of clay mineralogy and technology, the interaction between organic molecules and minerals, and selected topics in biophysics. As the earth's ecosystem becomes more fragile and increasing numbers of people have to be fed, proper agricultural choices and decisions will mean the difference between sustenance and starvation across two-thirds of the globe. Pollution of both soil and water resources, erosion and soil depletion, among other environmental changes, are seriously impacting the ecosystem and further curtailing man's ability to produce food. In this respect, Israel experiences extreme conditions, as almost two-thirds of its area is still desert. Although the area under irrigation has grown more than six-fold since the establishment of the State, the country has already reached the "red line" beyond which more water cannot be drawn from its limited water resources without jeopardizing water quality. To ensure that Israel is able to feed its growing population and maintain its agricultural export with such limited soil and water resources, the development of state-of-the-art agriculture while preserving the environment and precious natural resources has become imperative. Immediately after the Hebrew University was established in 1925, its scientists devoted themselves to the most urgent task of finding groundwater. Their successful efforts made it possible to transform barren areas into rich agricultural land even before the State was founded in 1948. In the early 1950s, the Faculty of Agriculture established the Soil and Water Department to commence research on new systems of irrigation which would reduce water use, on the breeding of plants that require small quantities of water for growth and/or have high tolerance to brackish water, on projects for water conservation and more economical water use, and on maintaining and preserving soil properties and fertility under conditions of intensive use. Through comprehensive and in-depth research, the Department's scientists have been responsible for new knowledge and expertise, which have been translated over the years into higher agricultural yields. They have developed the ability to prevent over-irrigation and improper farming techniques, which would result in soil salinization and erosion. In 1981, the Seagram Company from Canada endowed and gave its name to the Department, and in so doing, substantially enhanced the work and research already being carried out by its faculty members. The interdisciplinary nature of the Seagram Center is reflected in the wide spectrum of both its scientific research and teaching programs. The Department offers study curricula towards B.Sc., M.Sc. and Ph.D. degrees in its fields of expertise. About 50 courses, starting with introductory courses in soil and water sciences and progressing to advanced, specialized courses for graduate students, are offered. 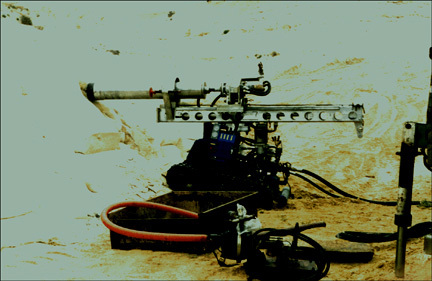 An International Post-Graduate Course in the Exploration, Exploitation and Management of Groundwater Resources is held biennially at the Seagram Center in conjunction with the Division for International Cooperation, Ministry of Foreign Affairs of the State of Israel and the Division for External Studies of the Faculty of Agricultural, Food and Environmental Quality Sciences . Students from developing countries participate in the course, which is held over a period of four months and offers a diploma to its graduates .